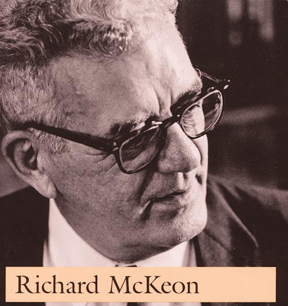 This website is designed to make Richard McKeon’s work accessible to individuals around the world with a variety of backgrounds and a diversity of interests. The selection of materials posted here is intended to reflect something of the scope of his contribution, with examples that range from the straight-forward to the most sophisticated, that reflect the span of his professional life from the 1930s to the 1980s, and that treat issues from across the full spectrum of human inquiry, activity, and creativity. After reading Zahava McKeon’s “General Introduction,” a viewer may be interested to turn next to the Autobiography section, where McKeon himself describes the origins of his philosophy and the problems it is intended to treat. Thereafter, the other sections of this website may take on more meaning.